And here are some of the food sights from the New York City leg of my vacation. 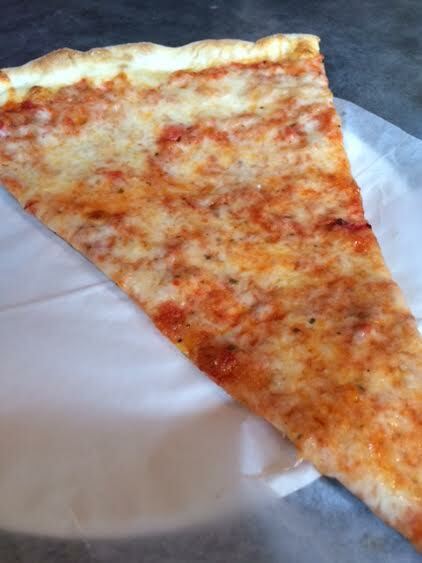 Above, a slice of pizza from a random spot in the Meatpacking District, which I point out mainly because it’s fun to type “Meatpacking District.” Anyway, it was a treat to walk from the sidewalk into an open storefront and buy a slice of pizza, a very New York thing to do and something that’s hard to pull off in the Inland Valley. 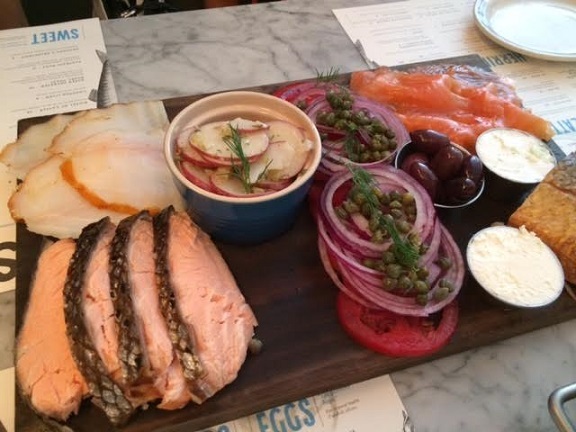 On the Lower East Side, another great place name, friends and I ate at Russ and Daughters, a Jewish deli, getting the Hattie, a platter with, clockwise from lower left, baked salmon, sable, lox and (only partly visible) kippers, and potato salad in the center. 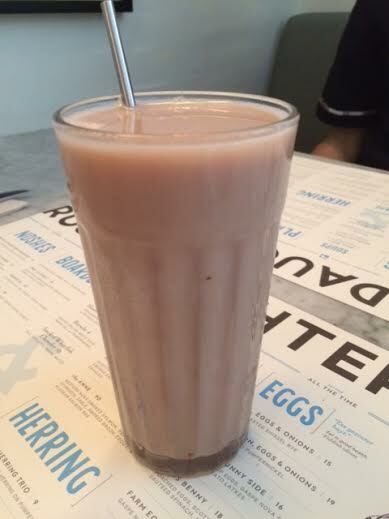 I got a chocolate egg cream. The appeal of egg creams is lost on me, but it was as good as any other I’ve had. The platter was delicious and came with a basket of bagels, bialys, pumpernickel and more. 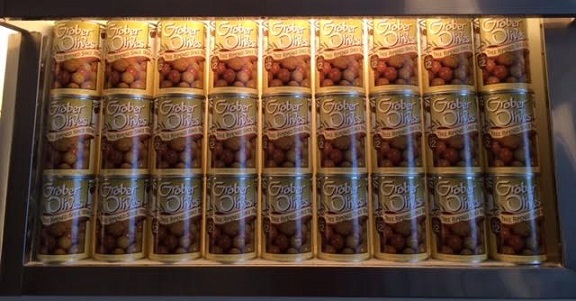 Most surprising sight at Russ and Daughters, and maybe my whole trip, was that among the wall displays over one booth was the scene below, cans of Ontario-made Graber Olives. Huh! 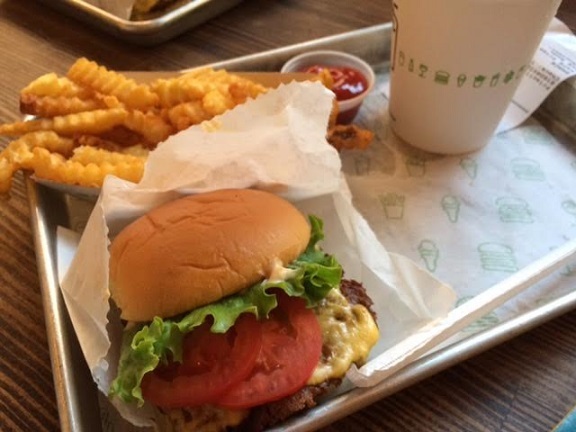 In Washington, D.C., last fall I became acquainted with the East Coast chain Shake Shack, and was happy to have a chance to try them again. This is high-quality fast food. 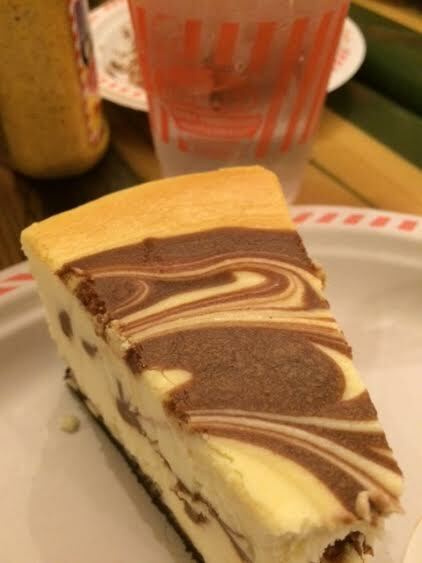 And I returned to a favorite from my only previous visit, Junior’s in Grand Central Station, where I got chocolate swirl cheesecake. 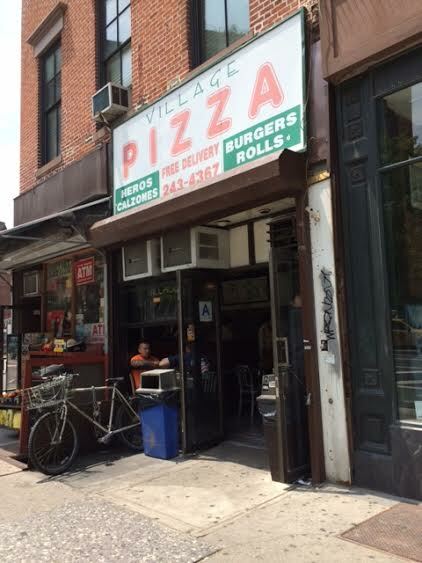 My last food before blowing town was a doughnut from Dough in Bed-Stuy. (Another place name that it’s fun to casually toss off, like a local.) They had only a few flavors, most unusual. I got hibiscus. Oh, man. 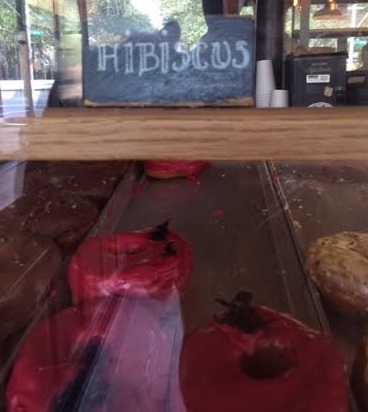 Thick, chewy doughnut, with thick, flavorful icing and a few leaves of actual hibiscus. This is the first doughnut I’ve had to rival Donut Man’s strawberry doughnut, and I had to travel across the country to get it. 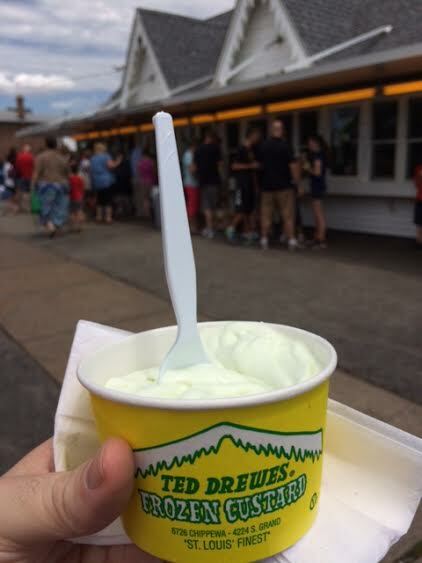 In lieu of a Restaurant of the Week post, here’s a report of eats from an exotic land, St. Louis, where I vacationed recently. 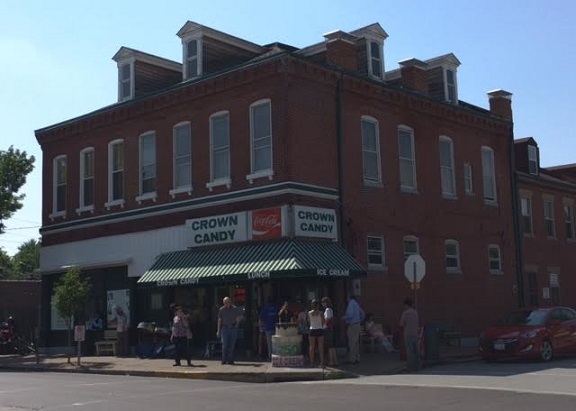 Above, frozen custard from local favorite Ted Drewes (since 1929); below, the exterior of Crown Candy Kitchen, famous (since 1913) for its ice cream treats, tin ceiling and, more recently, its BLT made with a dozen slices of bacon. Love the brick building and vintage Coke sign. 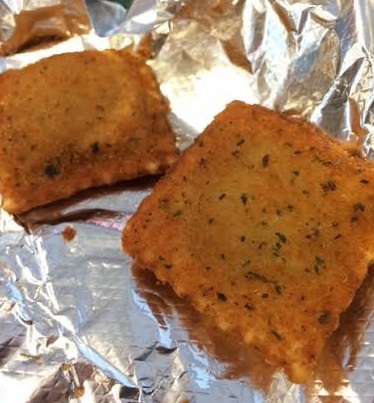 Toasted ravioli (with a cup of marinara for dipping) is a local innovation, as is St. Louis-style pizza, made with a crisp, cracker-like crust and processed cheese, cut into squares. It’s not to everyone’s taste, and it’s reminiscent of cheese and crackers, served hot. But I like it. 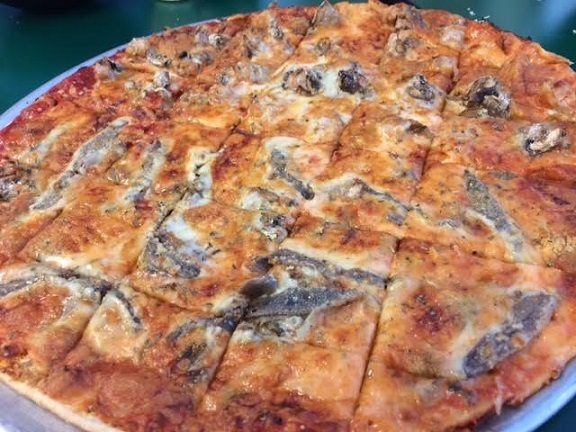 (Those are anchovies on the half nearest the camera, by the way.) Both examples are from local chain Imo’s. 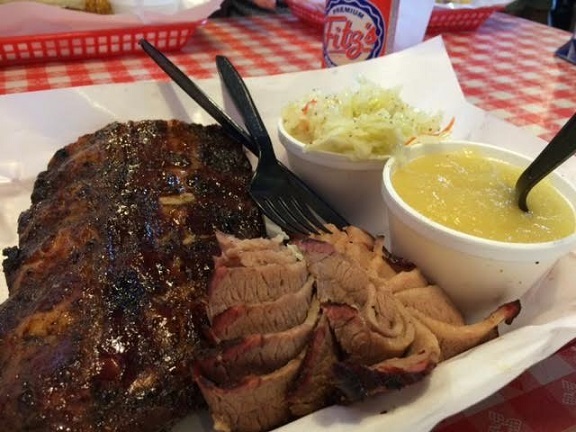 Below, pork ribs, brisket, slaw and applesauce from Pappy’s Smokehouse, plus a Fitz’s soda, bottled locally. 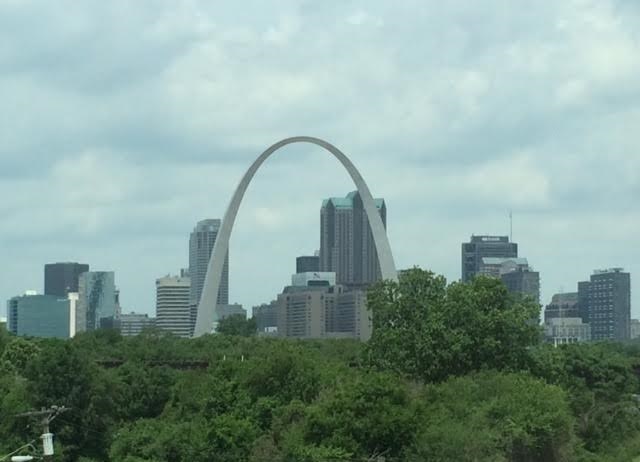 Wednesday’s column recaps highlights of my vacation, the Midwest part, and addresses the question of whether St. Louis is worth a visit. While you may be as unlikely to book a flight there as you would to Des Moines or Enid, the unsung city has more to offer than you might think: free museums, a giant park, a great baseball team and more. Plus water, and plenty of it. While in New York, I made a pilgrimage to — because the Empire State Building is passe — the intersection at which the cover for the Beastie Boys’ “Paul’s Boutique” album cover was shot circa 1989, Rivington and Ludlow on the Lower East Side. Admittedly, it was a letdown, and I’d have had to have the album itself with me to compare then and now. 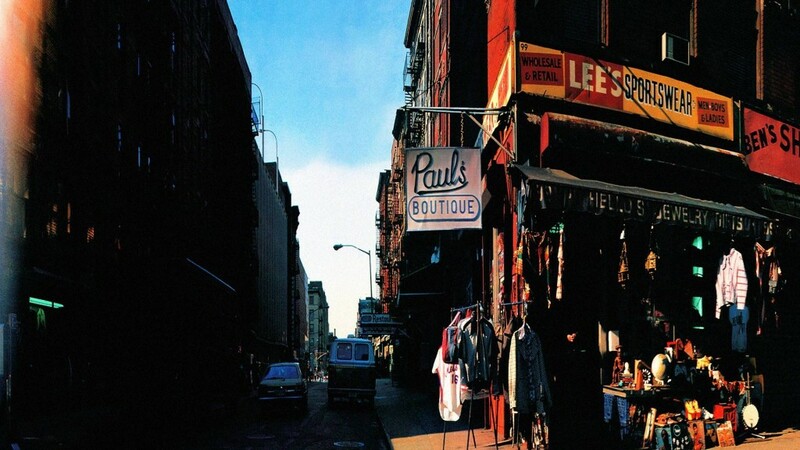 Even then, the corner was somewhat fictional, as the Paul’s Boutique sign was added for the photo shoot. Instead of a downscale sportswear shop, the corner now has a wraps place. One nice touch today is a street art mural of the boys on the side of the building, commissioned by a man who lobbied unsuccessfully to have the intersection honored as Beastie Boys Square. Here’s my 2014 column on the album’s 25th anniversary and its Claremont connection. 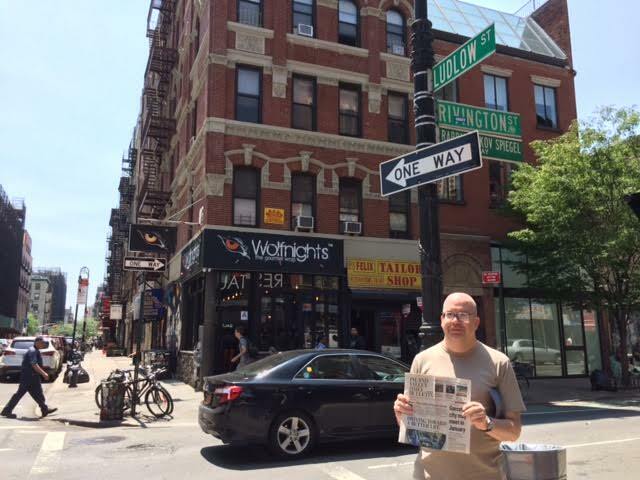 I brought a newspaper on my travels for the requisite Daily Bulletin on Vacation photo. Here’s the first of two that were taken in meaningful locations. 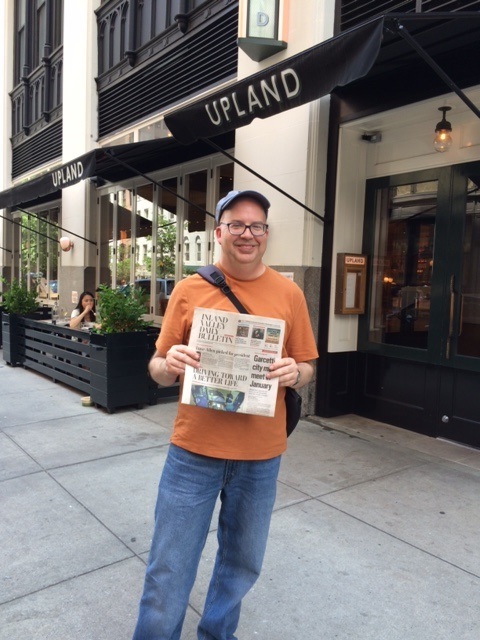 In this case, at the Manhattan restaurant Upland, where I dined with Rancho Cucamonga expatriate Lesley Tellez and met chef Justin Smillie. Column to come. By the way, the headline across the top of this Dec. 16, 2014 edition reads “Dave Allen picked for president.” Of the Auto Club Speedway in Fontana, but who’s counting? As noted at the top of Sunday’s column, I’m on vacation this week, as I was for part of last week, and there won’t be another column until June 15. See you then. And pay attention to my Twitter feed (a feature on the right-hand side of this home page) if you’d like to see some of what I’m up to. Sunday’s column has items from Upland, one of which explains the headline, as well as from Rancho Cucamonga and Pomona. The last one’s origin is unknown but it was too weird not to use. Friday’s column rounds up seven news nuggets from Claremont, alongside a plug for this blog and an item from Upland. 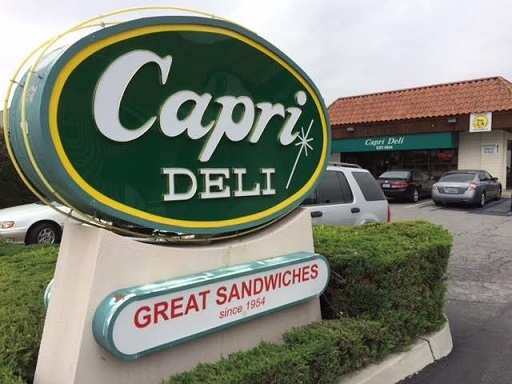 I saw a newspaper ad for Capri Deli on a recent Saturday morning, which reminded me that I’d once clipped a newspaper ad for Capri Deli and never went there. Having nothing to do, I decided to try it for lunch. “Serving great sandwiches since 1954” is an enticing motto, after all, promising not only a good meal but history. Capri was easy enough to find, not far west of Kellogg Hill off the 10 Freeway (and equidistant from the 210). Inside there was a line at the counter, which had multiple staffers taking orders and making sandwiches. This gave me time to look around and think over my options. 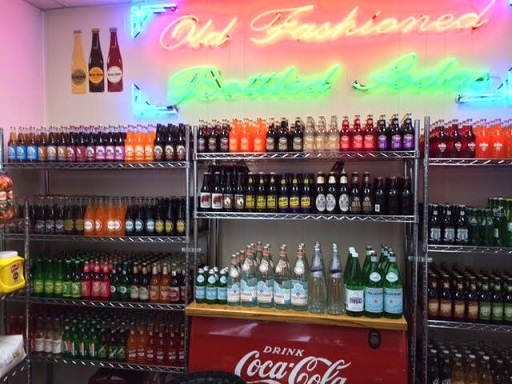 I also grabbed a bottled soda from the alcove of grocery items, where sodas are sold individually. 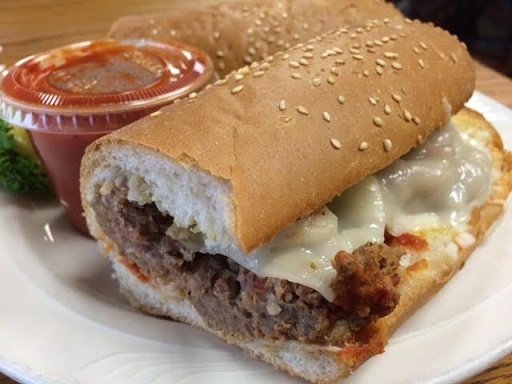 I got a meatball sandwich, the 12-inch version ($9), which was soon delivered to my table on a garlic roll, marinara on the side. A very good sandwich. 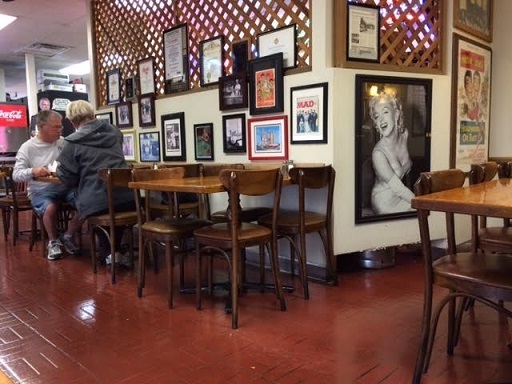 The dining room has kitschy, humorous decor. This is a busy place, clearly still popular in the Subway era, and that made me think of Grinder Haven in Ontario, which hasn’t been able to cut it in recent years. 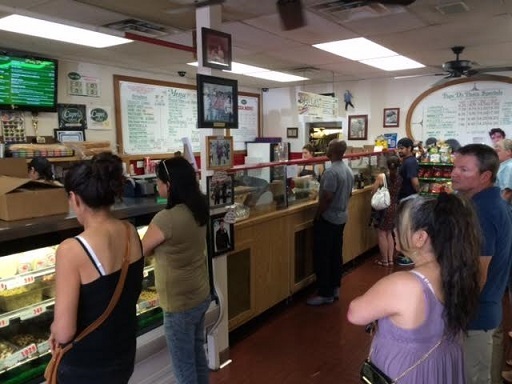 Capri Deli proves that people are still willing to line up for a better sandwich. The menu even uses the term “grinders” for its subs. I came back the next Saturday, this time getting the cold cut combo grinder, the 6-inch version ($7). The counterwoman listed all the toppings for me but I couldn’t remember them all: salami, ham, mortadella and a few more, with oil, lettuce and tomatoes. Another good sandwich, and this time I knew to grab my soda from the refrigerated case, where they seem to have everything. The dining room was almost full this visit. 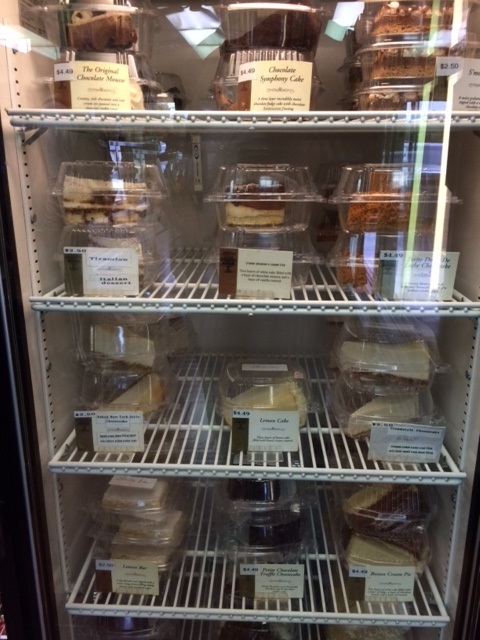 There’s a case of desserts too (see below), which looked tempting. The menu also has pizza and lasagna, salads and specialty sandwiches. Capri opened in 1954 nearby and moved to this location in 1979. 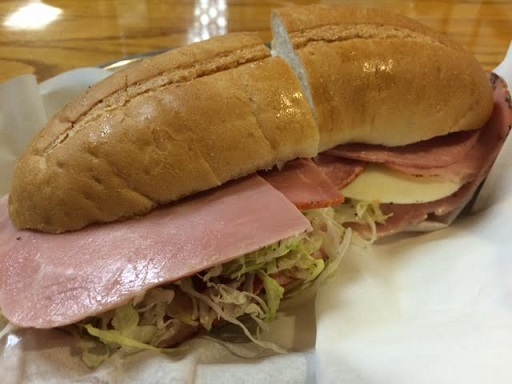 It’s rare that I write about a restaurant that’s not within the Inland Valley, but this is close enough, and it might be of interest to sandwich fans, including those who miss Grinder Haven’s glory days. Wednesday’s column rounds up six tidbits from Ontario, including news about the city’s volunteer of the year award, and two from Pomona.